I am trying to install virtualbox and make it work but it doesn't seem like I can. In the image you can see the output. 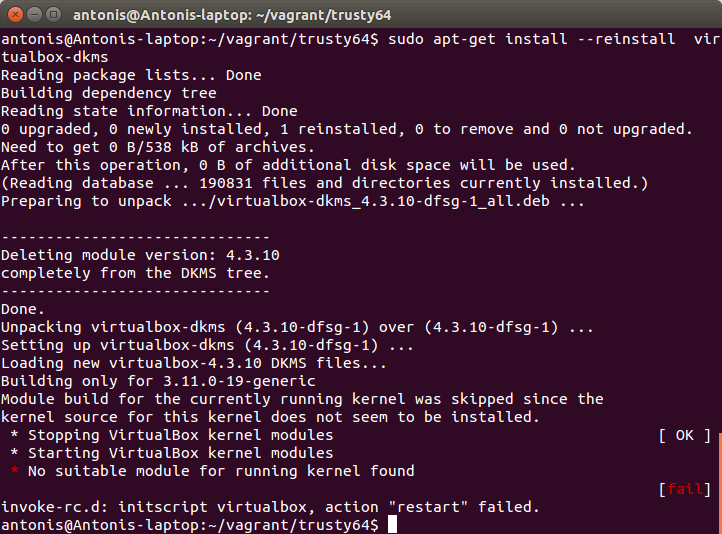 Also installed the sources as @Hmayag instructed, purged virtualbox and installed it again but I got the same problem. 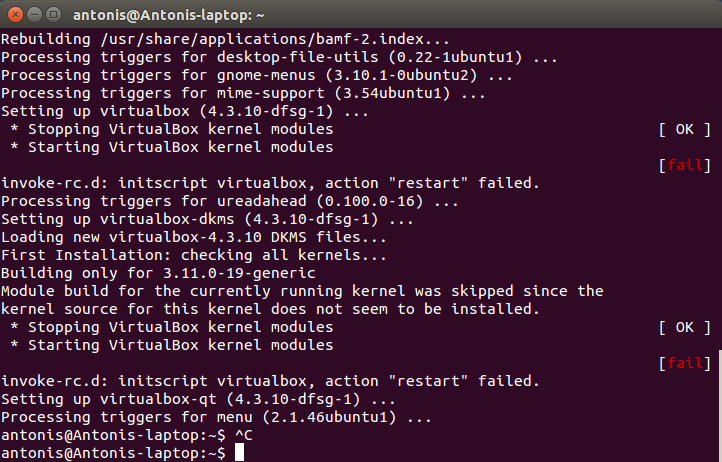 The reason for the problem is that you have booted the 3.11 kernel while the dpkg-reconfigure expects a 3.13 kernel. That's why you get the message 'no suitable module for the running kernel'. Be sure to update your bootloader. In my case the bootloader is updated from another OS (Debian) and booting to that and running sudo update-grub solved the problem. I wasn't able to fix the problem with any other solution suggested, so I made a fresh 14.04 installation and everything is fine now. In my case, the issue was having virtualbox-4.1 installed alongside virtualbox-4.2. Once I uninstalled 4.1, I could run sudo /etc/init.d/vboxdrv setup and sudo modprobe vboxdrv just fine, as well as start VMs. You probably are using a outdated version of gcc that is different of the gcc used by the Linux kernel. The clue is here: Please install the virtualbox-dkms package and the appropriate headers, most likely linux-headers-generic. Since you have the first, it must still want the second. Then make sure everything is up to date. I had the same issue. I found that the source of the problem is most probably that I'm using a custom kernel. Downloading the latest .deb package from virtualbox.org, and installing it by dpkg -i has solved the problem in my case. 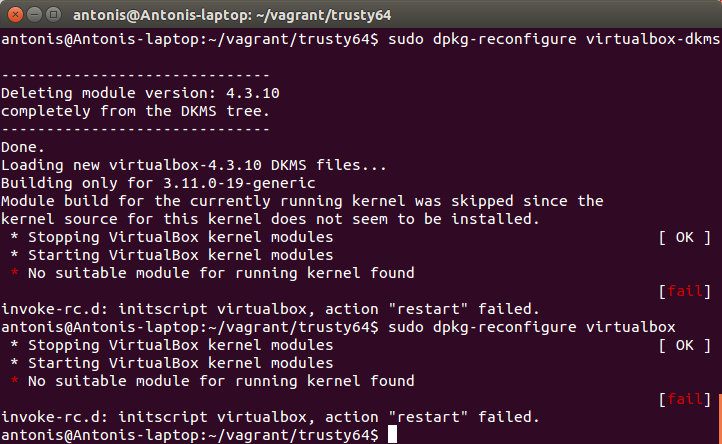 Virtualbox fails to load OS, even after terminal fixes?